India is a land of spirituality. This very spiritual nature of India interlaced with its breath-taking natural beauty lovingly attracts countless trekkers from all over the world. Every year, thousands of pilgrims embark on spiritual journeys in search of that elusive holiness in the mysterious grip of the Himalayas. The imposing yet multifarious Himalayas truly echo the Indian spirit of ‘Unity in Diversity’. This presents, in abundance, opportunities to spiritual trekkers of diverse religious beliefs. On your way to piety, you could fill in your lungs with whisk of fresh Himalayan air, bask in the crisp, sunny Garhwal weather, enjoy the serenity of quiet ambience while perking up your ears every now & then to hear the sound of eerie silence. Pamper your taste buds with tangy yet healthy dishes of Uttarakhand heavily influenced by Tibetan & Nepalese culinary styles because of proximity. Let’s find those top 5 places in the lap of the Himalayas where a sense of spirituality has lent an element of profoundness to the beauty of nature. 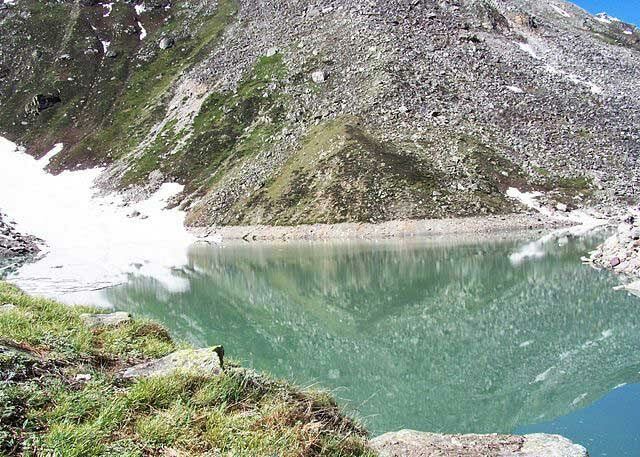 Hemkund, a Sanskrit name, derived from Hem (snow) and kund (bowl), symbolizes a perpetual bowl of love & harmony. This holy place attracts pilgrims from all religions who throng this site in the Garhwal Himalayan region at a lofty 4632 meters. 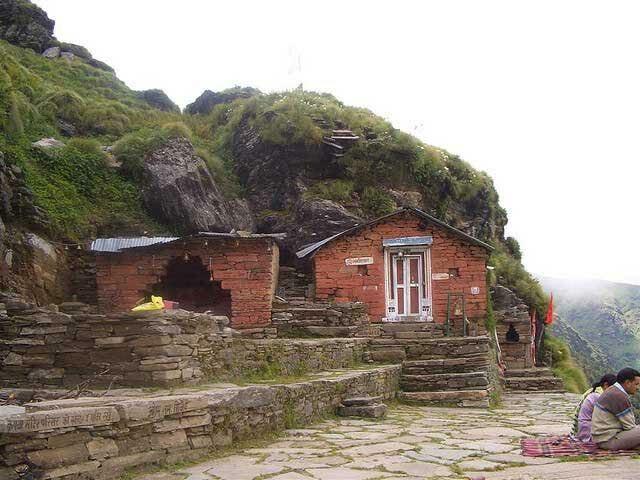 Hemkund Sahib is the highest Gurudwara of Sikh community overlooking a sprawling valley. This beautiful spot is laced with rain-soaked beautiful flowers glistening like beads of pearls & jewels in the Monsoon. 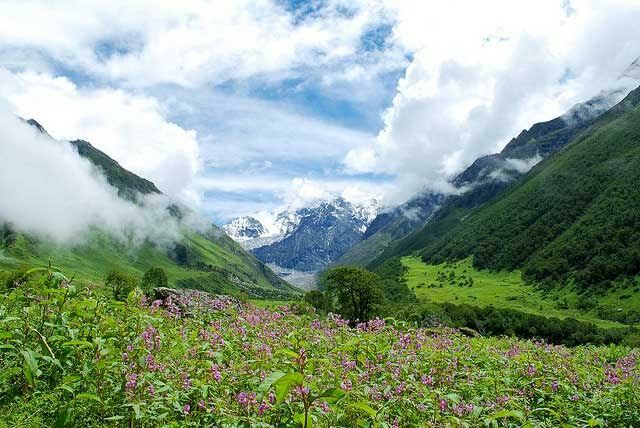 A glacial lake surrounded by seven mountain peaks & the Nanda Devi National Park, the Valley of Flowers form a major attraction for tourists. The trek begins in a town called Govind ghat, 275kms away from Rishikesh. The 13km trek can be covered by walking or by pony. It’s a short & easy trek with halts made at a Gurudwara along the way. The lush greenery, birds chirping away nice tunes, wide variety of colourful butterflies, sudden glimpse of a gullible musk deer, tantalizingly close lofty peaks beckoning at you make you feel rejuvenated. Overnight stay is not allowed in Hemkund sahib. From Delhi to Hardwar by train & travel to Govind ghat via Rishikesh by bus. Tucked away in the midst of snow-capped peaks in Uttarakhand, at a height of 4600 meters, this place has tremendous religious significance to the local people. It’s a popular belief that three Gods of the Hindus, Brahma, Vishnu & Mahesh bathe in that lake on an auspicious day. This place is also known to be visited by some rare varieties of birds. From Badrinath which is 22kms away, you are greeted with a few peaks enroute to Satopanth. The exciting trek is fraught with challenges in the form of a few glaciers. One needs to have an inner-line permit to be allowed to trek. Have you ever wanted to go visit a place which is far from the madding crowd, out of the creepy clutches of the regular hustle of a busy city life? 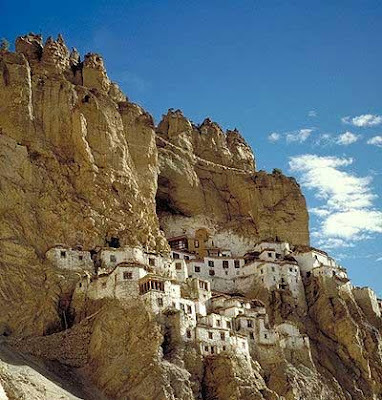 Phugtal Monastery in Ladakh district of Jammu & Kashmir is such a place. Away from the roving eyes, 8 hours away from the Padum, the biggest town in Zanskar in J & K, Phuktal or Phugtal is probably the most remote monastery in the entire Zanskar valley. The trek begins at Raru. En route, the villages Cha & Anmu stand out as two lush green islands in the generally barren landscape. A village called Purne, on the opposite side of river Lungnak, can be chosen as a camping spot. The villages are sparsely populated without any shops, schools or health centres. The imposing presence of the monastery fills one with a sense of awe. It has a school, a library, a guesthouse & prayer rooms. The smiling faces of monks, young & old, represent true happiness that we don’t get to find in our mundane materialistic world. Best time to go: April – Oct.
Padum, the biggest town in Zanskar valley in Ladakh district is the last road link connecting the Monastery with the world outside. Panch Kedar refers to five Hindu temples dedicated to God Shiva. The trek covers all five shrines Kedarnath (3583m), Tungnath (3680m), Rudranath (2286m), Madhyameshwar (3490m) & Kalpeshwar (2200m) situated at different altitudes in the Garhwal Himalayas. The popular folk connects the birth of all these shrines directly to the Pandavas and each temple is believed to be a limb of Lord Shiva that surfaced after he had escaped from the clutches of the Pandavas. The total length of the trek covering all five temples is about 200kms and can only be undertaken during summer & after the Monsoon. The take-off point is Gaurikund and should take about 15-20 days depending on the endurance of the trekkers. Breath-taking views of snow - capped peaks will help you forget the challenges on the hilly roads. Head out to Kedarnath from Gaurikund. Cover Madhyameshwar, Tungnath, Rudranath followed by Kalpeshwar in that order. This long & arduous trek will keep you on the road for a fortnight. But you won’t miss home much among the mysterious nature, the murmurs of rustling of dry leaves, birds whistling away your favourite tune that you have been longing to hear. From Delhi to Hardwar by train & travel to Rishikesh by bus. Situated on the banks of the river Mandakini at a height of 3583m, Kedarnath is a very famous pilgrimage site for the Hindus. It has a ‘’Shiva” temple, believed to be built by the Pandavas that witness every year a huge footfall of pilgrims. The trek begins at Gaurikund (about 2900m), famous for its hot sulphur spring. The 14 km-long uphill trek can be covered on foot. The road to Kedarnath is laced with many waterfalls, mesmerizing views of Chaukhambi peaks & sprawling Mandakini valley. You may choose to camp by the Vasukital Lake. It is about 8kms further down, full to the brim with water so transparent you feel as though your quest for sanctity has come to an end. Best time to go: May & June or Aug & October. You can begin your journey from Delhi and reach Gaurikund via Hardwar & Rishikesh. Besides the picture-perfect landscape of the Himalayas, the innocence of the locals & the variety of mouth-watering cuisines of this region spruce up the entire journey. Nothing can be more fulfilling than to experience the calm & compelling splendour of the Himalayas where beauty meets spirituality to redefine a whole new meaning of human life. Rohit likes to share his travel expeditions and communicates them regularly through his blog at Transindiatravels.com. We would definitely grab the opportunity to do these treks! Trekking in India and in the Lower Himalayas is one of our dream adventures. Great... Just follow your dreams. You can do it. Very good post, my father and uncles visited Hemkund Sahib and Valley of Flowers. You have done great work on the blog.